View of the Sandals Halcyon Beach Resort at sunset. The Pier restaurant is also shown. View of the beach at Sandals Halcyon Beach Resort, taken while the sun was setting. 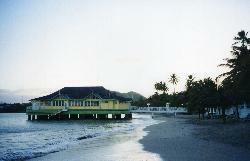 Photo of main pool and buffet restaurant, at Sandals Halcyon Beach Resort in Castries St. Lucia. from site: This is the most intimate and low-key of the three Sandals resorts on St. Lucia. Like the others, though, it's beachfront, all-inclusive, for couples only, and loaded with amenities and activities.